These mid-sized flying Heartless put the wind to expert use when attacking. They move swiftly, so wait for them to swoop low, then strike. Also note that they are immune to Aero magic. The Air Battler is an Emblem Heartless that is found in Kingdom Hearts 358/2 Days. An Air Battler is a vaguely humanoid Heartless with navy blue skin and two large, dark blue, curled wings. Its head is spherical with a jagged mouth and glowing yellow eyes, and it is mostly covered by a cyan helmet. This helmet is adorned with two conical, white spikes on either side, two angular, black spirals on its front, and a curled, dark blue antenna on its top. Most of its body is also covered by cyan armor, with its Heartless emblem emblazoned on its abdomen. 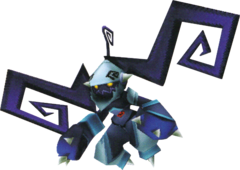 The Air Battler's legs end in small, white spikes and it holds a blue punching weapon lined by white spikes in each hand. The Air Battler's name refers to its aerial fighting style and its aggressive disposition. Like its other variations, Air Battlers are always in the air. It is immune to Aero, but other types of magic such as Thunder and Fire may be effective against the Air Battler. It is easier to use magic against the Air Battler as it is always in the air and jumping up to attack it may begin to get frustrating. When it pulls back to dive, chain Dodge Rolls to avoid it, and resume casting once it ascends again.